In 1884, Portuguese authors Jose da Fonseca and Pedro Carolino decided to create a guide to conversational English, even though they spoke none themselves. The result, English as She is Spoke, is still popular today thanks to the comedic value of its dialogue, which ranges from silly (“At what o’clock dine him?”) to downright baffling (“Take care to dirt you self.”). Not surprisingly, it wasn’t much use as a textbook. It’s one thing to speak one language and not the other; it’s another to claim — and wrongly convince yourself — that you’re speaking the foreign one when you’re not. While this may be amusing in the context of a 130-year-old textbook, human resources professionals face the same problem in business today. At senior levels, executives and business leaders aren’t taking those of us in HR seriously, not because they “don’t get it” or aren’t enlightened, but because we are walking around claiming (and believing) we’re speaking one language when we’re actually speaking another. Performance-based learning and development professionals shouldn’t rely only on competency-driven needs assessments to create behavioral objectives. A job description is an outcome of a job analysis, whereas a job specification is an outcome of a job description coupled with additional stakeholder input. Employee engagement and retention require that the workforce be empowered with flexibility, innovation and creativity in inclusive ways. If you’re a well-versed HR professional, each has meaning to you. But, consider them from a CEO or divisional executive’s perspective. She’s looking at some aggressive product and financial goals for the year — those are her outputs. She has a team of people and a set of financial and physical resources against a backdrop of norms and agreements about how people work together and organize themselves — those are her inputs. And she’s trying to figure out how to get from input to output by mobilizing those people and resources to create those results. Put yourself in her shoes; give yourself that problem, and all the problems that go with it. What is it you’re saying? Now reread the three sentences above from the executive’s mindset. If you’ve followed this reasoning, all three will sound like complete gobbledygook. If not — if they still seem sensible — try getting a bit further into your executive character by reading this script aloud: “I’ve got hundreds of employees arguing with each other as they work to develop and support multiple products, dozens of customers threatening to move to competitors if we don’t hit aggressive timelines, and key investors pushing to realize return on market offerings we haven’t even deployed yet. How am I going to get to my results with my resources?” Now, read the three statements again, as answers to that question. 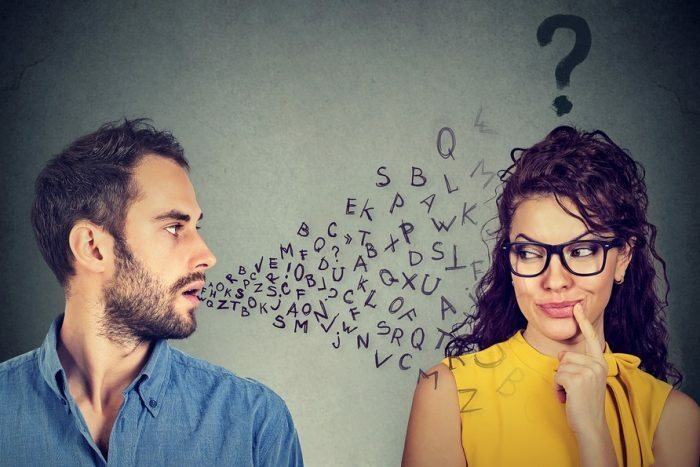 The uncomfortable truth for many in HR is that we think we’re talking sense, but we sound just as disconnected from our internal clients as the pages of English as She is Spoke seem to English speakers. Worse yet, just like da Fonseca and Carolino, too often we offer our erroneous chatter not tentatively, and not in the spirit of learning more, but in full misplaced confidence that we’re on the mark when we’re nowhere nearby. To get out of that pigeonhole, we must realize that the value we offer to our senior clients has nothing to do with how evolved we think we are, or with concepts like those in the three examples above. Our role from their perspective must be concerned with the other part of the input in the input/output equation: The backdrop behind the people and resources, including things like how people work together, how they organize themselves and how they perceive their roles with respect to each other and to the broader market. I call this “the platform,” suggesting a metaphorical stage on which people and resources are placed and move around. But terms like “operating system,” “culture,” or even simply “organization” work equally well, provided they’re not overburdened with other connotations within the company. Whatever you call it, this is the value HR can claim and the sale we can make: “Our job in HR (or talent management) is to optimize the platform underpinning everything. We create the most effective possible conditions for you to mobilize your people and resources to meet your goals.” When the platform is running correctly, managers and teams at every level are better able to do their jobs — producing their outputs in coordination with each other and clearly defining what they need in order to do so. That’s how managers and teams make all kinds of intelligent decisions, including those about how many people to hire and with what skills. Does HR fill requisitions? Yes, we consult with hiring managers to help them achieve their clearly defined goals. Do we calculate compensation tables? Sure, in support of needs defined within the teams and across departments. And we also work on how nimbly the managers manage, how clearly the executives define mission and vision, how consistently the organization practices its values, and how effectively we can change course when needed. The purpose of HR isn’t to throw candidates over the wall or throw feel-good jargon around in meetings, it’s to provide a strategic advantage to the business in the form of how well it combines its people — that is, Human Resources — with its other resources, so that goals can be achieved repeatedly over time, in a way that’s beneficial both to the organization and those who are part of it. What’s the alternative? A whole career working beneath your capability. And, as da Fonseca and Carolino told us long ago, “It would be better to work as you deliver to the business who you do.” Whatever that means.